A couple of weeks ago I did a quick overview of Microsoft’s preview of Word for Android Phone. Since that overview, Microsoft has already released another update to the preview, giving it more stability and improving some of the functionality. Now it is time to look at PowerPoint for Android Phone. Like Word (and Excel), it is also in Preview (or as it use to be called, beta) so if you decide to download these apps you may run into the odd behavior or bug. PowerPoint for Android Phone is impressive. In my “day job” I use PowerPoint on a daily basis and regardless of platform – Windows Phone, Android or iOS – I have found Office for Mobile (the old Microsoft Office app for phones) to be very limiting and in some cases, useless. That is not the case with the new breed of Office apps and PowerPoint for Android phone is a prime example. It is feature rich and easy to navigate, a far cry from it’s predecessor. In fact, if you were stuck with only your Android Phone and had to create a presentation, this app is more than powerful enough to allow you to do it including things like slide transitions and photo inserts. It is as close to desktop PowerPoint as you can get on a phone and unless you have some very specific need, PowerPoint for Android Phone will do 99% of what the average user needs. 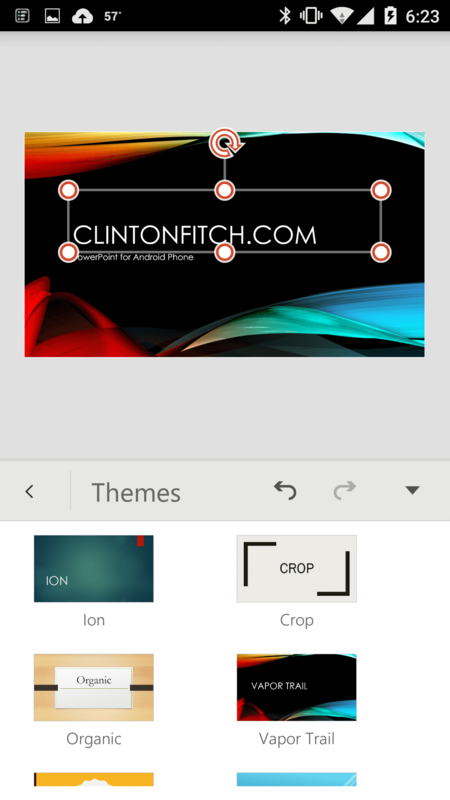 Like Word, PowerPoint for Android Phone is designed to get you up-and-going on a presentation quickly. When you start the app you can select an existing PowerPoint file from your OneDrive or DropBox account (assuming you have configured it) to open or you can create a new presentation. If you select a new presentation, you will be given the theme options for your new presentation. There are 24 built-in themes for you to chose from in the app. Adding text to a presentation is usually a matter of simply double-tapping the box where you want to type that text. Like the other Office for Android Phone apps, the ability to change fonts, sizes and colors are all driven from the Ribbon at the bottom of the screen. Functionally, it is identical to Word so I won’t repeat myself on the Ribbon to large extent but will focus on the PowerPoint specific menus. Take a look at my Word for Android Phone overview for some of the basic functionality found in the Ribbon in the Office apps. 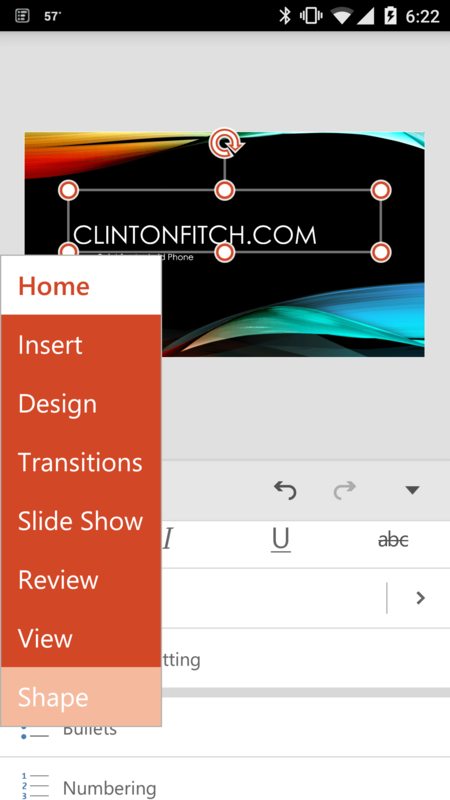 The main menu within PowerPoint for Android Phone allows you to select a wide range of functions built into the app. This includes things like slide transitions, inserting objects into a slide, reviewing a presentation or going into a slide show mode to see how your presentation flows. The menu is found in the left corner of the Ribbon menu when you open it for easy navigation. have the presentation on your PC. That’s not the case here. Transitions are identical to those you would find in PowerPoint on your desktop as well as your Android Tablet, Windows Phone or iOS device. Yes you can do a bit more customization of these transitions on your PC but again, the aim is the 99% of users and Microsoft nailed it. The other big feature that the app has is the ability to add slide notes. As I mentioned earlier, I live in PowerPoint nearly every day and while I don’t use notes on all presentations, I do when it comes to making sure I hit key points or if I’m speaking to a large crowd. Adding notes or editing notes in this app is literally a tap away. Tap on the notepaper icon at the top of the display and you will get the notes pane opened for the slide you are viewing. There you can add your notes in the style that works best for you. Once you are finished, tap Done in the upper-right corner and your notes are saved to that slide. Photos or Google Drive and Dropbox to get those photos or other files. Once you have the photo you want on the slide, you can crop, rotate and re-position it on the slide to make the most of it. You can also add things like frames and drop shadows for added effect. 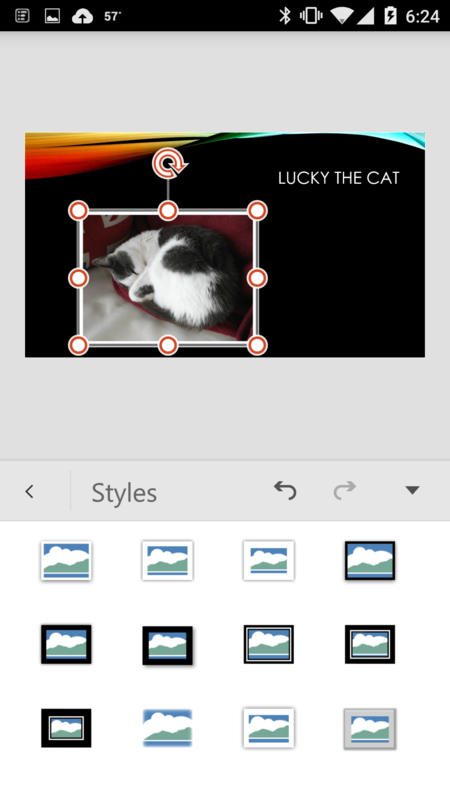 Finally, PowerPoint for Android Phone fully supports landscape mode. When I posted my quick look at Word, I noted that I could not get the landscape mode to work and after talking to the Microsoft team on Google+, the feature was there but for whatever reason I couldn’t get it working on either of my Android phones. Since that post an update has been released and I can now use landscape mode in Word, Excel and PowerPoint. For some, this will be a no-big-deal feature but if you have a 5″ display device or larger, it is really handy to be able to edit and view presentations in landscape. Overall I’m quite impressed with what Microsoft has done with PowerPoint for Android Phone. It is feature rich and powerful enough to allow you to edit and create presentations on-the-go with your phone and not feel hamstrung by a lack of features or functionality. I will again remind readers that the app is in Preview mode so if you don’t want to run the risk of a buggy app on your phone, you should wait until they are generally available later this summer. That said, I’ve had no issues with stability or performance using the app and frankly haven’t run into any bugs with this build. Once you join the community, Become a tester by clicking the links to the Word,ExcelandPowerPoint.